As it has many times before, this year's London Fashion Week has brought with it plenty of controversy over its unreasonable and unattainable standards of beauty. We look at some of the small start-ups who are fighting back by presenting women with models who actually look like them. It may be the middle of September, but the industry that’s always six months ahead starts preparing for next spring’s shows. London Fashion Week is becoming increasingly consumer-focused, with shows live-streamed online and designated runway shows for the public. The runway-to-retail business model is forecast to be the future of fashion, and Topshop led the so-called "democratisation" of London Fashion Week this year by launching a collection titled "September 2016". This collection features clothes that can be bought straight off the runway instead of waiting 6 months to purchase them. But even as fashion moves to a more customer dominated focus, the issue of body image and the desire to be beautiful hangs over the industry. According to research commissioned by the charity Beat in 2015, around 725,000 people in the UK - 89% of them women - are affected by an eating disorder. A survey of over 3,200 Australian women earlier this year found that 23% of women listed weight gain as their top health concern, even over cancer or mental health issues such as depression. Earlier this month, the Women’s Equality Party (WEP) launched a campaign ahead of London Fashion Week 2017 calling on the British Fashion Council to ensure that designers use two different sample sizes on the catwalk. The #NoSizeFitsAll campaign is designed to raise awareness of body image issues for women and girls in the UK. As well as campaigning for one of the catwalk sample sizes to be a UK size 12 or above, they are also calling for a change in the law so that models that have a BMI lower than 18.5 must be seen by a medical professional and deemed well enough for working. The WEP are not the first political players to get involved in the body image discussion, with the Green Party announcing last year that they would try to block City Hall funding for Fashion Weeks of future years unless there is an agreement that all models are of a BMI that is 18 or higher. Sophie Walker, the WEP party leader, claims that issues surrounding the body image debate are not being taken seriously by other political parties because of their attitudes towards women in general. They believe that the fashion industry needs to both recognise that it can and that it has a responsibility to effect change regarding body image issues. Some brands are already ahead of the game, and use their diverse models and lack of Photoshopping as a marketing tool. Neon Moon, a feminist lingerie brand based in London, embraces stretch marks, body hair and freckles instead of retouching the images of their models. They stock lingerie in sizes such as “lovely” and “fabulous” rather than using traditional numerical sizes. Another company breaking the mould with their models is ModCloth, a US-based e-retailer that has used its own staff to model their swimwear designs for the second year running. Lashing back at campaigns such as Protein World’s “Beach Body Ready”, ModCloth promotes the idea that every body is a “swimsuit body”. 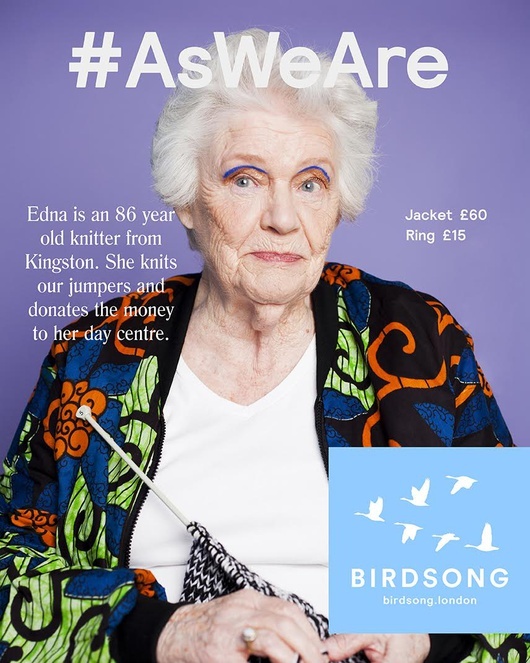 "We want every woman to realise that they're good enough as they are"
Proving that such business strategies do not limit popularity or scalability is Birdsong, an emerging fashion brand based in London that has ethical and feminist principles at its core. Sarah Beckett and Sophie Slater, the co-founders of Birdsong, believe that fashion is a fundamentally feminist issue. The brand empowers women by sourcing products from a variety of struggling women’s organisations. They vow never to use Photoshop, and use only street-cast models to promote their brand. They are currently raising investment to be able to develop the brand and expand their range of products on offer. Sophie’s interest in combining fashion and feminism started in her early teens. "My interest in feminism and fashion arrived at the same time, coincidentally," she says. "I was always interested in clothes, but my mum never shied away from saying she was a feminist so it rubbed off on me. I accidentally read my first feminist text (Wetlands) and got into fashion magazines at the same time, around the age of 14. I think getting into feminism informed my tastes in fashion, and I stopped reading Vogue and picked up more diverse, unisex magazines like iD and POP instead. They featured models that were more androgynous, and had different bodies in by virtue of linking fashion to culture." Sophie met Sarah on a free postgraduate course called Year Here, based around social change. The pair had not always imagined that they would be entrepreneurs. Sarah had been quite content running around for other people and didn’t feel like she had the entrepreneurial drive that some possess: "It wasn't until we were on the Year Here program and we had a solution to a problem that we thought could really work, that I realised what we could build." 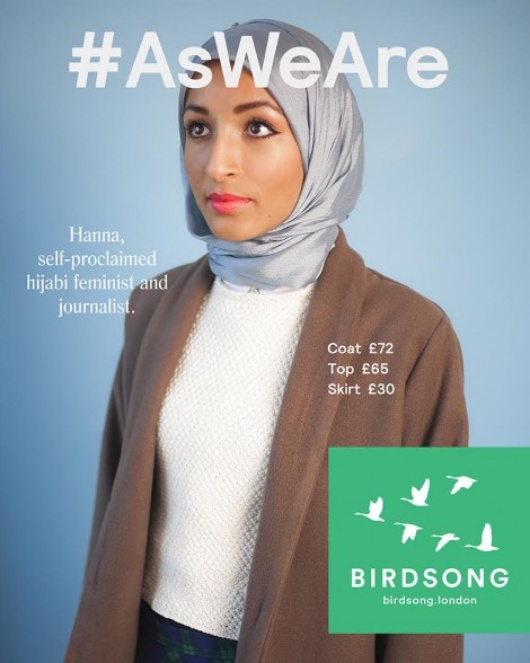 Models on the site have included feminist activist Hanna Yusuf, who wears a hijab for her photoshoots; trans activist Charlie Craggs; and Edna, an 86-year-old knitter who makes jumpers sold on the site. Sophie did some modelling work for an agency in London in her younger teens and was told to ensure that she stayed at her current size, even though she was medically underweight. She believes that the fashion industry has a massive role to play in ensuring that women are represented by people who look like them. "We want to start a dialogue, and for every woman who sees our ads to realise that they’re good enough as they are," she says.